Marshall Watson’s first book reveals how to make traditional interiors fresh. Known for his meticulously researched, European-inspired style, Marshall Watson creates interiors that are rich in texture, detail, and simple luxuries. In his first book, Watson shares his finest work, demonstrating that while each of these homes is as unique as its owner, they all adhere to principles that transform a mere series of spaces into a genuine, coherent home: warmth; light; peace; comfort; balance; proportion; livability; and last but not least, appropriateness. Whether in an Italianate villa in Los Cabos or a family idyll on a Swedish island, a Gramercy Park apartment that blends shimmer and restraint, or a Newport Beach cottage warmed by walls finished in egg-yolk yellow, Watson explains how he translated each family’s lifestyle and aspirations, the house’s history, and the surrounding environment into a highly original form of elegance—and how anyone can discover his or her own. Beautifully photographed with lavish images of Watson’s work, this inspiring book is a must-have for interior design lovers. New York designer Marshall Watson received a degree in design from Stanford University. In 1986, he founded his design firm, Marshall Watson Interiors. His work has been featured in Architectural Digest, Veranda, House Beautiful, House & Garden, Luxe, Hamptons Cottages & Gardens, The New York Times, and Traditional Home. He also received Traditional Home’s “Designer of the Year” award and has been featured on Luxe’s Gold List. Watson has produced signature lines for Edward Ferrell + Lewis Mittman and Doris Leslie Blau. "A chic edition that showcases an Italianate villa in Los Cabos, a family idyll on a Swedish island, a Gramercy Park apartment, a Newport Beach cottage and beyond." "It’s perhaps as close as the reader is going to get to a signature for a designer whose style is really your own." "In his first book, Marshall Watson shares with readers his European-inspired style, in projects ranging from Los Cabos and Sweden to Palm Beach and the Hamptons. The tome focuses on how Watson creates coherent homes for his clients that are livable, and draws on the families’ lifestyles and aspirations. 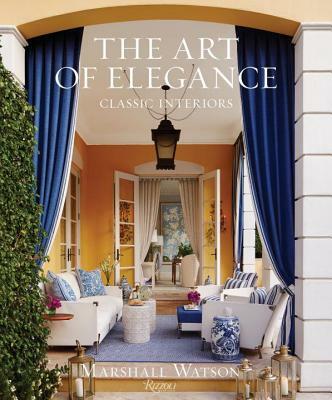 (Rizzoli)"
"Marshall Watson's book The Art of Elegance: Classic Interiors is a compendium of the designers projects that hew towards timeless style. Working with soft colors and a layering of classical and contemporary elements, Watson's interiors are at once high style and relaxed. "I devoted my first book to the subject matter of elegance because it encapsulates my career's direction and hopefully, my career's achievements. And couldn't the world use a little more - along with a touch of civility and kindness," says Watson." "What struck me about Watson's work is its confidence. Watson eschews the gimmicks, choosing instead to give his clients' homes interiors that are comfortable, attractive, livable, and normal. How refreshing." "For his first book, Watson shares stunning imagery culled from his most impressive projects, ranging in style and locale from an Italianate village in Los Cabos toa seaside Newport Beach cottage."